Most of new Smartphone brands trying to hit the low-mid range segment by proving good features in affordable prices, To stand in such competition Samsung launches its other low-mid ranger Samsung Galaxy J5 that is featuring Snapdragon 410 Quad-core processor, 5.0 inches AMOLED capacitive touchscreen, 13 MP & 5 MP camera, 4G support, 8/16 GB ROM with 128 Ext SD Support, 1.5 GB RAM and 2600 mAh battery. 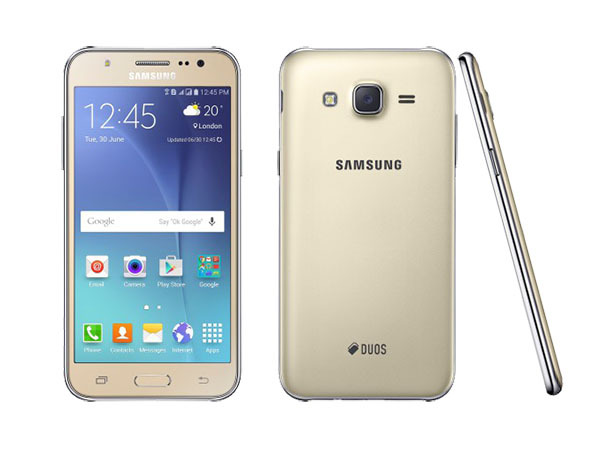 Here we will have Short review, Pros and Cons of Samsung Galaxy J5. In the all handset of ‘J’ series Samsung maintained its traditional design; with silver rim in edge and faux metallic plastic body. The back of the handset feels slightly slippery in hands. The bottom of the phone holds the microUSB port, headphone jack, and microphone. On the left volume buttons, while the power button is located in the right side. There is nothing new added in the shape or design though the gold colour option feels premium with outrageous look. The sharpness of the screen is pleasantly reflected by the AMOLED display which is successfully able to deliver a good viewing experience. The screen has HD (720 x 1280 pixels) resolutions with 294ppi of display density that is low compared to many Smartphone although pixels in the display in not noticeable. In the heart there is Snapdragon quad-core processor with 1.2 GHz clock speed performs well with combination of 1.5 GB RAM and Android v5.1 (Lollipop) that has Samsung TouchWiz. We are quite comfortable with its performance although some of new software updates released in November 2015 have bugs that causing slight heating and hanging issue in Smartphone. If you are at some place in day time where natural scenery looking awesome and you snap a picture from your J5, definitely you will have a good shot from the 13 MP rear camera; but the photos taken in low light loses detailed information in the picture and comes soft. Front camera is Selfie is better than many handset of this price group we can put in at the above average range. 4G experience with Ultra Data Saving Mode. Clean UI with No bloatwares. OTG cable is supported in this handset. The 5MP front camera also has flashlight. Rear camera quality not up to the expectation for low light. Out of 8 GB Available memory is only 4.25 GB. No special screen protection such as Corning Gorilla Glass. This low-mid range Smartphone from Samsung loaded with eye-catching features such as 13 MP camera, Both side flash, 128 GB expendable memory, super AMOLED screen etc. Although same as other phones it also has some advantages over disadvantages. The handset is well performing, slim, with traditional Samsung design. The things that i want change in this handset are the bugs that causing heating and hanging issue, average 13MP primary camera. But it has also has an advantage for Samsung brand that provides a great customer service after shipping of the phones.